i did a project on onitsuka tiger for one of my marketing courses in uni. though the brand is rather popular in europe (i saw it everywhere i went when i was backpacking in europe; on people’s feet, in stores, etc), this brand is only starting to be more popular in asia recently. onitsuka tiger is a japanese brand and it’s funny how it took off in europe faster than in asia. that time when we embarked on the project, onitsuka tiger didn’t have significant marketing efforts as compared to their competitors. so it’s pretty interesting to see this new campaign by onitsuka tiger to promote its new range of sneakers in europe! 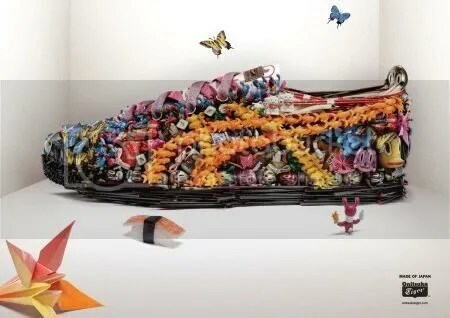 “The company has created a 1.5 meter long sculpture made out of Japanese collectibles, which has been exhibited throughout the Europe to launch its tiger range. The sculpture seems to be made of many small Japanese toys that might have helped people to know that the brand hails from Japan.